Believed to be a hybrid (Hakea myrtoides x petiolaris), Hakea Burrendong Beauty is one of the most popular of the genus. 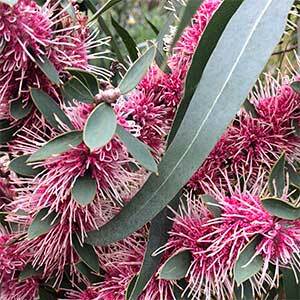 Flowering in late summer to winter this is one of the best Hakea cultivars. Masses of flowers, and also easy care given a few basic conditions. Good drainage and low humidity are essential, in wet soils, or areas of high humidity it can suffer die back fairly quickly. When if flower this is bit of bee magnet, it also attracts birds to the garden which is great. Choose a position in full sun with good air flow. A well drained soil is essential, raise the garden bed a little in damp to wet soils. 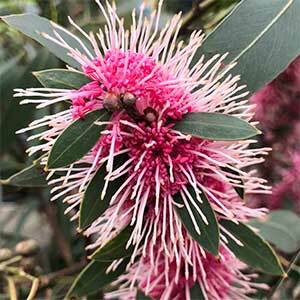 It is possible to grow Hakea Burrendong Beauty in a container, however it is far better off in the ground. Pruning is advisable and this is best carried out from when the plant is first planted. Prune the tips of each stem back by up to 10 cm each year, do not prune back into old wood. Spread – Will spread to around 3 metres over time. Flowers – Large pink flowers in clusters held close to the stem. Flowering season – Late summer, to winter.